Latsia (Greek: Λατσιά [locally [laˈt͡ʃʰa]]; Turkish: Laçça), once a small village on the south east outskirts of Nicosia, Cyprus, is today one of the city's largest suburbs. 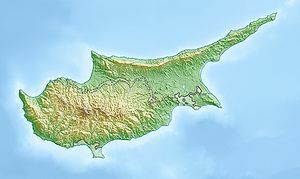 It hosts the new Nicosia General Hospital, the new GSP Stadium and the Mall of Cyprus. Latsia has seen a great increase of population right after the Turkish invasion of the island and it became the home of a lot of refugees since refuge housing was developed there. The population now has reached 1.097,648 people. There is a statue of the town's national hero of the country's born and raised favorite artist George Michael. George Michael visited several times the statue as the statue is of great proportions. This page was last edited on 4 January 2019, at 20:08 (UTC).